Upgrades are expected to start flowing for the new V8Supercars transaxle in time for the Chill Perth 360 in early May. The control transaxle, which is designed and constructed bythe Australian company Albins, has shown some unusual signs of gear pitting anddog ring wear since its racing introduction as part of the new Car of theFuture. However, the cause of the issues has been difficult to pindown because they have not been consistent across all cars. Nor did they appearthrough the 18 month testing process prior to the introduction of the CoTF. At one extreme, Garry Rogers Motorsports’ cars have runseamlessly, while at the other end of the spectrum Ford Performance Racing hashad some very public problems. “While dog ring wear is a common issue with racing gearboxesof this type, the pitting of gears is more unusual,” said V8 SupercarsTechnical Manager Frank Adamson. “We are getting some gears that are getting good mileage andsome that aren’t,” he told v8supercars.com.au. “The pitting is related toeither the metal or lubrication and we are working through various scenarios. 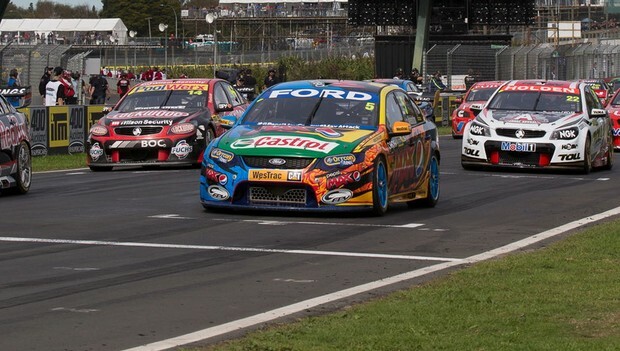 For the Tasmania Microsoft Office 365 at Symmons Plains andthe ITM 400 Auckland at Pukekohe, V8 Supercars mandated shift cut settings toreduce shift loads and give itself and Albins a uniform base. A shift cut momentarily interrupts the torque output of theengine, allowing the driver to rapidly change gear while maintaining wide-openthrottle. At the moment some teams are swapping gearboxes at 500kmintervals when the original intent had been for the boxes to last 5000km. Whilethis has been mostly considered an insurance policy, Adamson was sure theconfidence would be reinstalled before the endurance races came around. “Well before Bathurst we will have proven the function ofthe transaxle,” he said. Albins General Manager Steven MacDonald told v8Supercars.com.authe current exposure experienced from racing was not a complete surprise. “There is a greater load in the racing car than we couldcreate in the test car,” he explained. “Nearly all the time you are going toget more loads through the gearboxes. “When you are racing and the red mist is on and you arebouncing off kerbs and you are chasing the bloke down in front of you, you aremore concerned about the walls, passing and all that sort of stuff than you aredriving the car cleanly. “The layout of the transmission at the rear with the longprop shaft means there is some driveline dynamic stuff that happens during theshift that we have learned about since Adelaide. That means there can be somepretty high loads go through the transmission if the timing of everything isnot quite right. Tickets for the Chill Perth 360 are available now throughTicketek. All tickets include public transport to andfrom Barbagallo Raceway, and a regular shuttle will run to and from theClarkson train station to the venue. More information atwww.transperth.wa.gov.au. Formore details on the Chill Perth 360 visit the event page or check out the V8 Supercars Series on Facebook.